It's still early June, but, as they say, "the mock draft never sleeps." Well maybe only I say that, but drafters have already been active on Fantasy Football Calculator and the consensus ADP for next year is beginning to take shape. Over the next couple weeks we will take a look at the ADP landscape as a whole, first doing reviews of specific rounds, followed by risers and fallers throughout the summer as training camps begin. This week, we are looking at key player placements and trends in the first two rounds. After multiple years with more and more wide receivers littering the top 24 picks,2017 saw the beginning of a shift back toward running backs.2018 looks to be culmination of that trend, with 8 of the first 9 picks coming from that position and 16 of the top 24. This is due to the surprising emergence of numerous carry dominant/talented running backs and an inconsistent wide receiver position with plenty of questions. Last year was a down year for marquee wide receivers, and it shows in their ADP. The tiering appears to be Antonio Brown and DeAndre Hopkins at the top, with serious questions coming immediately in the second tier. Odell Beckham Jr was out the whole year and Julio Jones only scored 3 touchdowns. Fantasy owners can expect a return to form for these players, but the uncertainty is showing in their lagging ADP. Beyond these four, a consistent Michael Thomas and Keenan Allen, things get dicey quick. The next wide receiver is an overhyped Davante Adams sporting a surprisingly high ADP and two more 2017 disappointments in AJ Green and Mike Evans. How the position shakes out over the next two months will be interesting to watch, but right now there is value in the late second round. Lack of belief in Kareem Hunt? I'm pretty confused at Kareem Hunt's current ADP of 1.09. Maybe everyone only remembers the subpar showing in the playoff game? Hunt was a monster last year on his way to a 4th place points finish within the position. Not to mention he put up huge totals in week 14, 15, and 16 which is fantasy playoff winning time. Look for his ADP to rise through the summer. 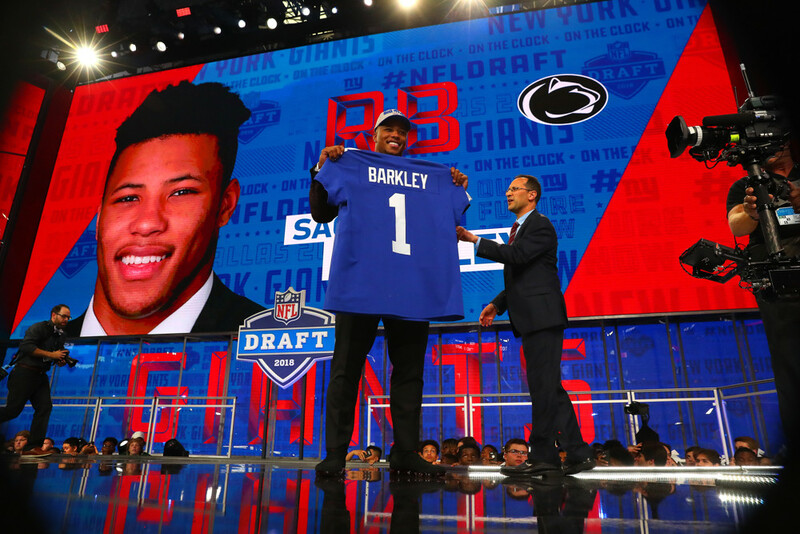 What to do with Saquon Barkley? One of the more interesting plot lines of mock season will be where rookie running back Saquon Barkley's ADP falls. Currently the belief is very high, with an ADP of 1.06 that puts him above known fantasy commodities like Leonard Fournette, Melvin Gordon and the aforementioned Hunt. I'd expect that to fall a bit, but it appears he will be firmly in the first round heading into draft season.